Last Tuesday night I went to Amsterdam for another edition of “Bike & City” about the role and place for cyclists in European urban space. The theme was: “What can cities learn from each other in terms of using public space? What are the different strategies of these cities?” There was a key-note presentation from Meredith Glaser about the (distinct) differences between Rotterdam and Amsterdam. Adam Stones was in the hall as well, to inform the audience about developments in London. The acting Bicycle Mayor of Amsterdam, Anna Luten, explained about her work, together with Maud de Vries. Finally there were two people who were giving an on-line talk. Clotilde Imbert was in Brussels explaining about cycling in Copenhagen and Mark Ames from Strategic Cities was brought in live from Sydney (where it was 6 am!) to talk about the cycling in London. The whole evening was in English and recorded. 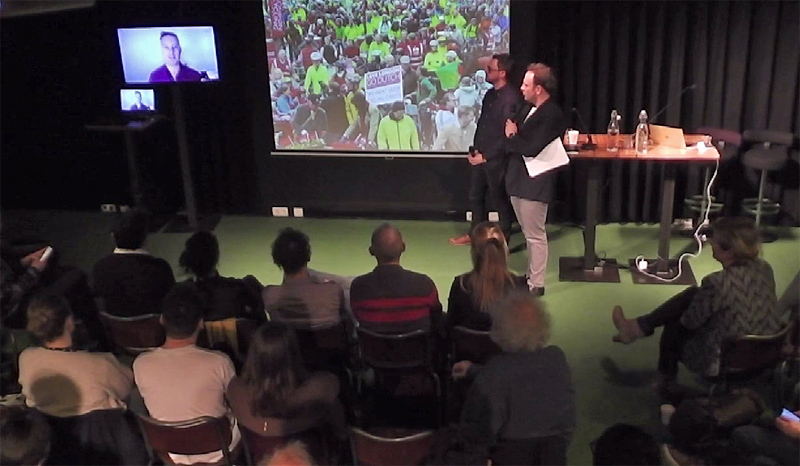 You can see the full two-hour event in a video made by the venue “Pakhuis de Zwijger”. Mark Ames directly from Sydney, on an event in Amsterdam, talking about London cycling. Still from the recordings by Pakhuis de Zwijger. High praise from Mark (who didn’t even know I was there hearing this) for which I thanked him of course, after the event on Twitter. Bike City #11 from Pakhuis de Zwijger on Vimeo. A bicycle/pedestrian ferry arriving at the shared space ferry terminal behind Amsterdam Central Station in the evening. I came to the venue by bicycle of course; an OV-Fiets which I had rented at Amsterdam Central Station, where I had arrived by train from Utrecht. From the rental bike location I went through the tunnel to get to the back of the station. When I reached the ferry terminal with the shared space solution, I noticed it was the golden hour, just before darkness, and the sky was an incredible deep blue. 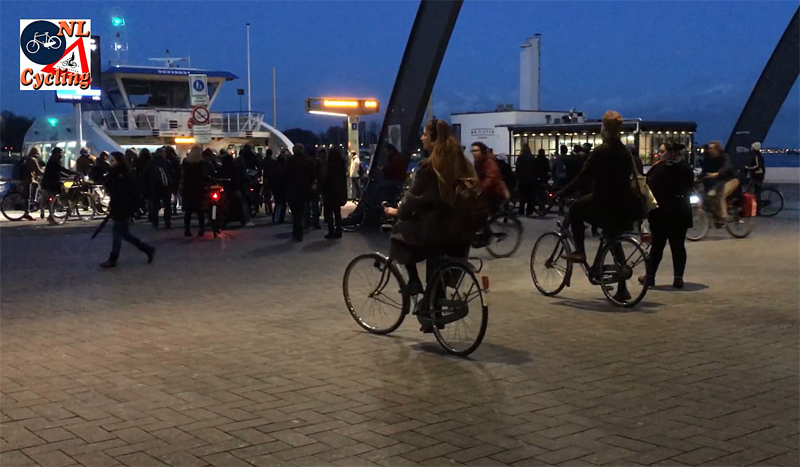 With a ferry arriving I got out my phone and filmed two minutes for you to see and hear what it is like there just after the evening rush hour around 18:45h on a Tuesday. Enjoy! A short video of the shared space ferry terminal at Amsterdam Central Station. That was quite an achievement getting to see the Fietsburgemeester. We haven’t seen anything offer in Amsterdam and, along with Cycles space, she seems terribly ill-informed about the situation in Amsterdam. For instance they were apparently completely unaware of the Parliamentary Internet consultation about scooters on the bike paths. Thousands of Amsterdam cyclists made their feelings known, but the Bike Mayor was completely invisible. Apparently she’s off to New York soon and let’s hope a true representative of Amsterdam cyclists can take her place. The person she has nominated seems more proud of her new Mini (from her dad’s dealership) than of her bike. It feels so good to see so many people using bikes. Can you suggest something or give any ideas for countries like India, where there is so much population and traffic on the roads? And most of the cities are really crowded. All India needs is Dutch-style bicycle infrastructure, and your traffic problems will be solved. Since bicycle infrastructure is so much cheaper than any alternative, that is clearly the way to go for a poorer country such as India. If you wanted an immediate reduction of about half, or more, of the pollution you should ban vehicles that pollute. You should encourage people to bicycle by educating them on the vital health and economic benefits. A bicycling infrastructure can then be built with only a fraction of the savings of the reduced pollution. You need to have someone at the top give these orders to make it happen, or have everyone do it voluntarily. Voluntarily is best. Blogs can shift Mountains and certainly your Blog is one of those which is proved now.. Thanks for the bonus post, and good to hear about you getting this well deserved recognition. I hope it feels good to know you’ve made a difference. I’ve seen that video shared a lot, but personally I always find myself linking to the one “who else benefits from the Dutch cycle infrastructure”. I want people to understand it’s not all about the lycra fraternity, because so often that’s all people see here in the UK (not that I have anything against lycra!). Bravo, great recognition here. Your videos do have the ability to help affect change. Every time I hear our city councillors “proclaim” that our city is not the Netherlands and we shouldn’t even try to be, I send them to your videos. This entry was posted on 7 March 2017 by Bicycle Dutch in Original posts and tagged Amsterdam, dark, ferry, watching people cycling.